Slotland may be known around the world for its selection of unique online slot games, but with its most recent new game it may become a destination for another casino favorite: Keno. Today they launched Keno 101, a traditional version of the classic casino game with red and white playing cards that you'll find very familiar if you've ever played keno in s casino. Until April 30, 2017, there's a choice of casino bonuses with various wagering requirements that you can claim to try the new game. 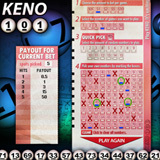 Keno is a simple game of chance: choose up to fifteen numbers from 1 – 80 and hope that they’ll be randomly drawn. The more matching numbers you get, the higher your payout. To begin, choose the amount to bet per game ($.50, $1, $2, $5, $10) and how many games to play. Then, click numbers on your playing card to select them or use the Quick Pick feature. The game randomly draws 20 numbers. When one matches your selection it’s highlighted and the Summary card instantly shows how much you've won. 21X wagering requirement; valid for Keno 101 only. 14X wagering requirement; may be claimed up to twice per day; valid for all slots and progressive jackpot games. 12X wagering requirement; may be used up to three times per day; valid for all slots and progressive jackpot games. 10X wagering requirement; may be claimed once per day; valid for all games. These bonuses are valid until April 30, 2017 only.